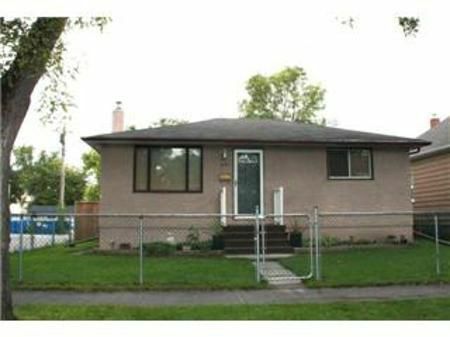 This Fort Rouge bungalow will charm! Front entrance welcomes with newer front doors. Living room features cove ceilings and laminate flooring. U-shaped eat-in kit boasting fridge, stove, & built-in Bosch dishwasher. Master and 2nd bdrms complete with laminate flooring. Totally remod main bath ('09) boasts all newer fixtures incld soaker tub, pedestal sink & heated ceramic flr. The developed lower level offers generously sized Rec room with newer development- including berber carpeting & pot lighting. Computer/office space also with newer flooring. The lower level offers an abundance of storage space which could be developed into an additional bedroom. This home benefits from a newer high efficiency furnace ('07), central air ('01), and shingles ('06). Out side find the fenced landscaped yard featuring newer deck and detached garage with auto opener.